This instrument is Bluetooth compatible and portable, so all information can be communicated wirelessly to a printer or a PC. With the unit’s large memory capacity, it can store up to 1,000 sets of target data and 4,000 sets of measurement data. 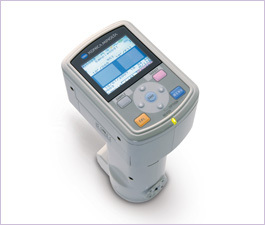 With SpectraMagic NX software compatibility, the CM-700d Spectrophotometer easy-to-use and displays multiple views of editable data results. Target data of the primary target can be associated to two or more secondary targets, allowing users to check for color difference and other sophisticated QC applications. Put information into the software using simple drag-and-drop for easy interpretation after printing. Information can be displayed using a variety of graphs. Preconfigured templates are available, and show instrument information at a glance by utilizing the status window. Transfer data compiled with older software into the newest updated software. Easily export information into Excel if needed to show data, and the Color Tutorial and Navigation Function are included with the software for additional information. ∗2 Applicable Bluetooth® profi le: Serial Port Profi le, Output: Bluetooth® Power Class 1 The communication distance may vary depending on the obstacles and radio wave conditions between the devices. Successful wireless communication is not guaranteed with all Bluetooth®-ready equipment. —2 Bluetooth® is a registered trademark of Bluetooth SIG, Inc. and is used under license agreement.